Brandon Adams leads the Poker Masters leaderboard after winning Event #2 on Sunday. (PokerCentral photo/Drew Amato). With just two events of the 2018 Poker Masters in the books, Brandon Adams has established himself as the leader in the clubhouse. 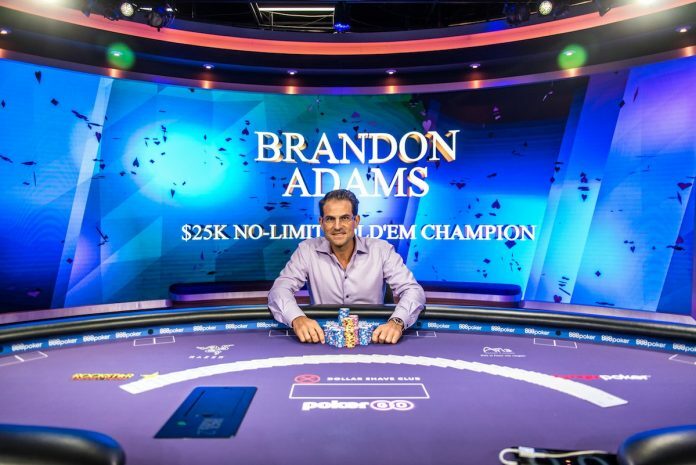 A day after finishing 4th in Event #1, Adams topped Event #2 ($25,000 No Limit Hold’em) to pick up $400,000 and put himself atop the Poker Masters leaderboard. Adams started the day second in chips and ended up eliminating three of the final five opponents on his way to victory. He picked off his first victim just 20 minutes after Day 2 began. Adams raised to 75,000 from the cutoff with and Daniel Negreanu called from the button with . After the flop, Adams check-raised to 205,000 after Negreanu bet 60,000. Negreanu called. The turn was the and Adams bet 405,000 and then called when Negreanu moved all in. The river was the and Negreanu was eliminated in sixth place. Jared Jaffee, who began play Sunday with the chip lead, picked up his first elimination of the day just 45 minutes later in a blind vs. blind situation. Action folded to Jaffee in the small blind and he moved all in with and Jason Koon, down to slightly less than three big blinds, called with . The board ran out to eliminate Koon in fifth. While Adams and Jaffee were atop the chip counts with four players left, the bottom two players clashed in a pot that saw one of them sent packing. Jake Schindler raised to 110,00 from the cutoff with and Bill Klein shoved all in with for 410,000 more. Schindler called and then watched as the flop, turn and river kept him in front the entire way and eliminated Klein in fourth. Three-handed action started with Jaffee holding more than 50% of the chips in play and Adams on the short stack but a big hand changed the dynamic dramatically. Adams raised from the button to 150,000 with , Schindler called from the small blind with and Jaffee defended his big blind with . The flop came and Schindler and Jaffee both checked. Adams bet 250,000, Schindler go out of the way and Jaffee moved all in. Adams called all in and then watched as the turn and river gave Adams a bigger full house to double through Jaffee into the chip lead. Schindler managed to battle with Adams and Jaffee for almost 90 minutes before he saw his tournament end short. Jaffee folded the button, Adams moved all in from the small blind holding and Schindler called off his last 1,075,000 with . Schindler headed to the last card with 17 outs thanks to the runout but was out in third place after the river. Jaffee picked up pocket kings on the very next hand but couldn’t get any action from Adams’ . One hand later it was all over. Jaffee moved all in for 1,045,000 with and Adams called with . After the flop, Jaffee could only watch as the turn and river failed to pull him ahead of Adams who eliminated Jaffee to win his second Poker Masters title.